For most of the 20th century, Chicago was the second-largest city in the United States, lagging only New York. The Windy City. The City of Big Shoulders. The Second City, as it’s still sometimes called, despite losing that title to Los Angeles in 1984. But of all the ways that Chicago was similar to New York—skyscrapers, a port, a meatpacking center, a lot of people—art was not among them. 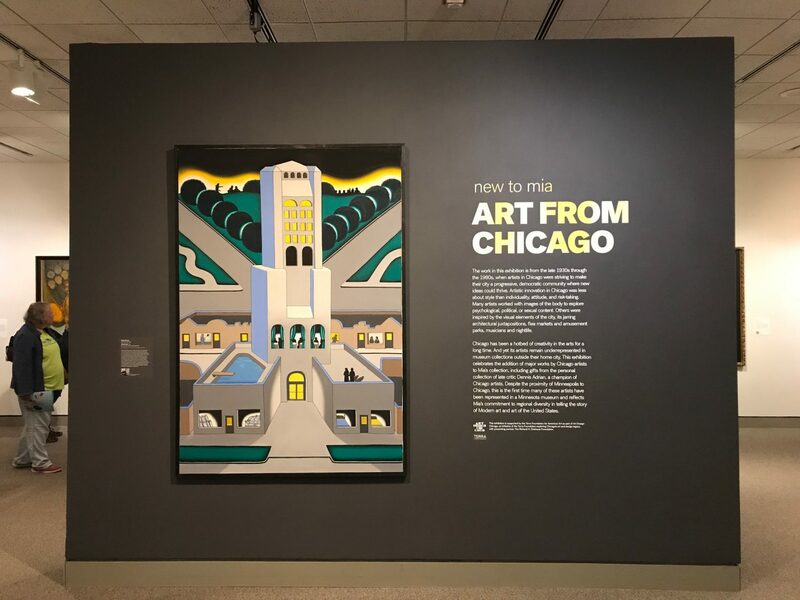 “New to Mia: Art from Chicago,” now on view in Mia’s Cargill gallery, presents a collection of artists active in Chicago during the latter half of the 20th century, when New York was the center of the art world. There, among the modernists, conceptualists, and abstractionists, Mark Rothko was painting soft fields of color. Frank Stella was working with clean geometric lines. Ellsworth Kelly was juxtaposing yellow blocks next to green ones. In Chicago, however, artists were up to somemething else entirely. “New to Mia: Art from Chicago” is now open at Mia in the Cargill Gallery off the lobby. The works in “Art from Chicago,” recently gifted to Mia, are strange, funny, and enigmatic. A warped skyscraper with black silhouettes peeking from the windows. A cartoonish woman in bunny ears and chains. A ledger of numbers floating in color fields. It’s not only unlike the art that was coming out of New York but almost anywhere else at the time. 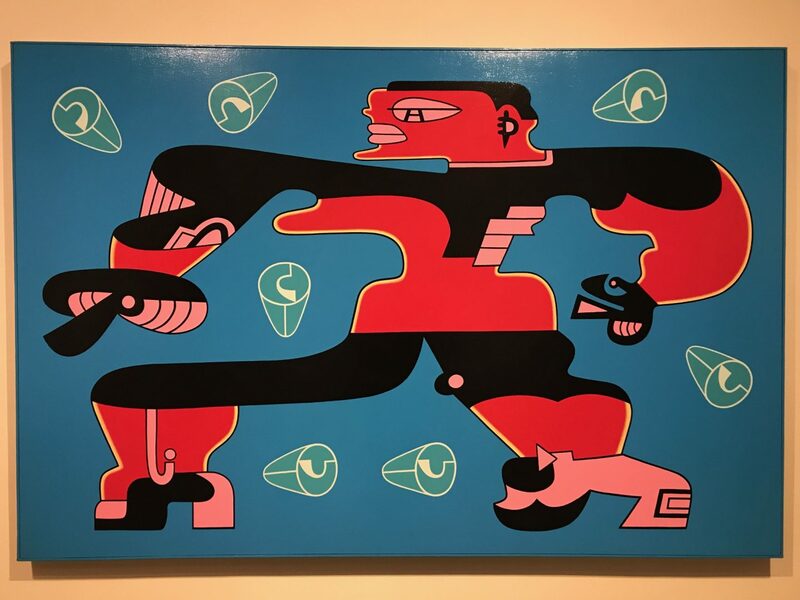 If you’re looking for a label, you might find these artists loosely packaged as the Chicago Imagists, though when I ask the show’s curator (and Chicago native), Bob Cozzolino, about them, he seems uneasy with the name. In other words, to say that Chicago artists made images is to say that Chicago architects made buildings—both a little too obvious and a little too vague. And yet there is something about these Chicago artists that makes them hard to categorize. Their work was often bright, highly designed, bodily, comic—influenced by Mad magazine and early zine culture. They drew from experience instead of trying to to categorize the universal; the work was personal, not conceptual. “The way that [the Imagists] understood how to be a modern artist, or a relevant artist, was to not copy, to never be accused of being derivative, and to follow their own personal vision despite where it led them,” says Cozzolino. They would never have done what Warhol and Lichtenstein did, he says, which is copy an image wholesale. Rather, they would take an image— warp it, distort it—and make it new again. There was a cultural attitude in Chicago that artists would do their own thing. Karl Wirsum’s “Streetwalker” painting, circa 1984, in the “New to Mia: Art from Chicago” show. This attitude would prove central to their art making. At the Field, Blackshear’s students were engaged by objects of all sorts: ceremonial tools, functional tools, objects with intricate decorative detail, even the museum displays themselves. They were taught to engage with human-made objects—not necessarily art objects—and think about how they were made, why they were made, and what elements might continue to their own creative practices. Encouraged by others at the Institute (Ray Yoshida and Whitney Halstead, in particular) the Chicagoans took these exercises to the streets. “[They] encouraged them to look in their neighborhoods, look where it wasn’t obvious, look where people weren’t directing them,” says Cozzolino. For a visual, he pulls out a book of photographs by Barbara Rossi. They’re images of Chicago street signs, variously colored, full of odd misspellings. “What she’s attracted to is that they’re all handmade,” he says. The open-air market on Maxwell Street was a favorite spot for foraging handmade objects: wrestling posters, comics, painted dolls, other oddities and amusements. Many Chicagoans collected theses objects (check out the Roger Brown Study Collection at the Art Institute of Chicago). They also drew inspiration from the city itself: giant turtle wax signs on top of art deco buildings, blues clubs, and burlesque shows. It was a kind of outsider art, these overlooked aesthetics, and it sparked in these artists a reverence for the marginal and bizzare. In all of these things, the Chicago artists were drawn to human creativity, formalized or not. They recognized art making as both a deeply personal exercise and a universal impulse. The street posters, the signs, the knickknacks—all of it created by a human maker. They possessed a reverence for creativity of all kinds—work that was unique, theatrical, sometimes volatile. Perhaps this is what makes their work so difficult to categorize, but it’s also what makes it so compelling. Lizzi Ginsberg graduated from Macalester College in December 2017 with a BA in philosophy. She is currently a communications intern at the Minneapolis Institute of Art.